In the late 80’s, a lot of games starred random weird looking pixelated animals on quests to save their friends. We had Sonic the Hedgehog, Psycho Fox, Rolo to the Rescue along with many more head-stomping, block-breaking, coin-collecting maniacal critters. Some of them were doing it to save their friends, some of them were doing it just for the hell of it, and in Penguin Land, the Penguin Mission Commander, named, Overbite was doing it to save his unborn family. 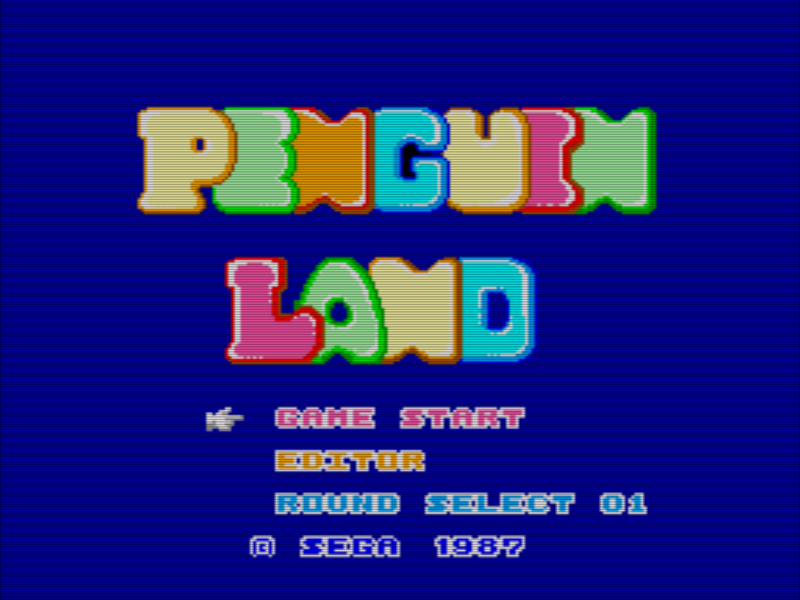 Basically in Penguin Land, you play a space penguin who has been sent to some planet to save the penguin eggs that have been stolen by some weird alien polar bear things. 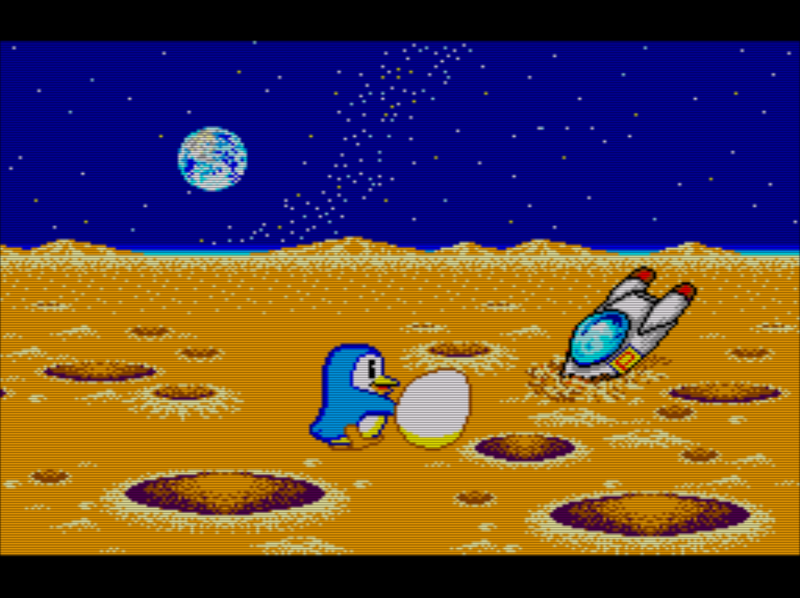 Each level starts with a a short clip of the Penguin rolling the egg over a moons surface. At the end of a level, you’re treated to three penguins carrying the egg past a window of a spaceship, which is to remind you they are space penguins, I guess. You have thirty levels to choose from in this game, and can pick whichever level you want to start on, straight away. The plays like a platform puzzler, but has a strong arcade feel to it. Your penguin has to get the egg from the top of the level to the bottom. This is done by breaking adjacent blocks of ‘ice’ and dropping the egg through them to lower platforms. If the egg falls a distance of more than four blocks, it cracks and you have to start over. If your penguin lands on the egg itself, it will roll to the side, unless it has nowhere to roll, in that case, you break it, what a bad penguin space dad you are! Along the way you will encounter traps, alien polar bears and bird monsters that poop bricks on you, all intent on destroying your young. You need to plan your route carefully, if you go the wrong way, you may be in a position where the egg is trapped and have to smash it yourself. On the plus side of things, this is a 1987 game that has a level editor option where you can create your own levels, that were backed up by a battery in the cartridge. You could pick blocks, monsters and obstacles from a list and place them on a line of the screen to create your own custom level, kind of like an ancient, extremely basic, Little Big Planet. But it was interesting, it was fun, and a good distraction for those who had completed Sonic a few million times and were waiting on the Megadrive to come into existence. The graphics were 8-bit blocks blocks. 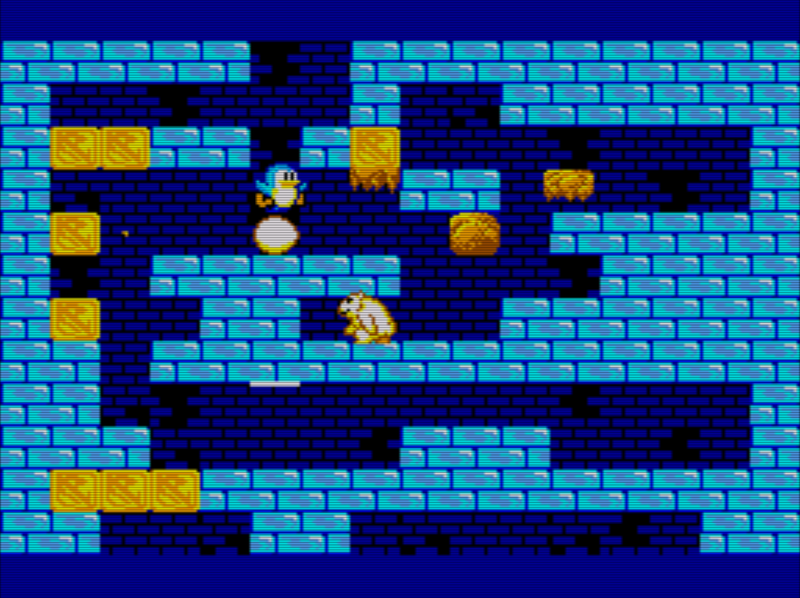 You could make out the penguins features and the polar bears, but other than that, this game was high in blue bricks that gave you a headache after a while. The music was similar to other games of the time, repetitive to the point where you were expected to be playing your own mix tape as you did. This would be a good game to try out of curiosity, but don’t expect it to hold your attention for more than five minutes. You’d probably have more fun with Rolo, Psycho or Sonic. If you want a retro bird hero, maybe look up that kiwi chap, from the New Zealand story.